This is the view from my daughter's bedroom. 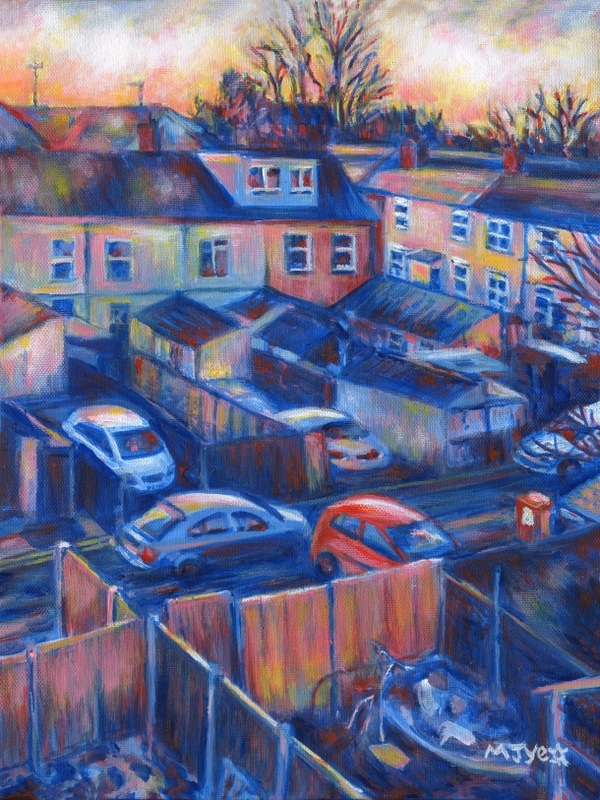 These back streets may not be an obvious subject for a painting, but if you look at the view as though it was an abstract painting, the way the shapes fit together, the angles and directions created by the lines of perspective, and the colours, the picture seems quite pleasing to me. I've kept the colours quite simple with a mixture of cold and warm colours. Although outside was cold and getting dark, there was also a glow of warmth from the colours of the sun setting and warm looking light coming from lights on inside buildings. This made me think of what I hoped was the warmth of humanity and safety inside the homes. Although we don't know what it is like in every home, I hope that is how my children's home feels for them. The painting means something to me because it is my family's home. It struck me that a painting is not just the way it looks in terms of colours and shapes, but it can mean different things to different people because they look at it through their own experiences and memories and what things the images in the painting are associated with in each person's mind.